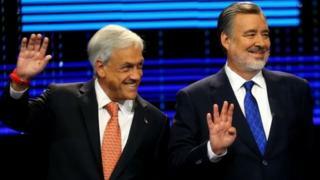 Conservative Sebastián Piñera is leading in Chile’s presidential elections, partial results show. With more than half the votes counted, the 67-year-old billionaire has 37%. Socialist contender Alejandro Guillier is second with 23% – just ahead of leftist hopeful Beatriz Sanchez (20%). The results suggest Mr Piñera, who held the post in 2010-14, will fail to get 50% needed to avoid a run-off in December. Incumbent leader Michelle Bachelet is unable to seek re-election. In all, eight candidates are vying for Chile’s presidency. On Sunday, voters were also electing all 155 members of the lower house and half of the senate. Opinion polls had made Mr Piñera favourite to win the vote. In 2010, he became Chile’s first conservative leader since the country’s return to democracy, ending two decades of uninterrupted centre-left rule. During the current presidential campaign Mr Piñera managed to unite Chile’s conservative wing, and enjoys backing of the business community. He represents the right-wing Chile Vamos coalition. His victory would mark another shift to the right in South America after the rise of conservative leaders in Argentina, Brazil and Peru. Mr Piñera’s main rival Mr Guillier is a former journalist and is candidate from Ms Bachelet’s left-wing Nueva Mayoria coalition. The 64-year-old pledged to continue a series of liberal reforms launched by Ms Bachelet, who is barred from seeking immediate re-election under Chile’s constitution.